There are some things in this world which are simply meant to be together: mac & cheese, cookies & cream, Kath & Kim… you get the idea. To say that Sydney artists Polographia and Winston Surfshirt are meant to be together is beyond an understatement; these artists melt together so much better and more naturally than arguably any of the pairs I mentioned before. The result of this matchup is Poloshirt – a smooth, chilled blend of funk, soul and RnB with a strong electronica presence at its core. 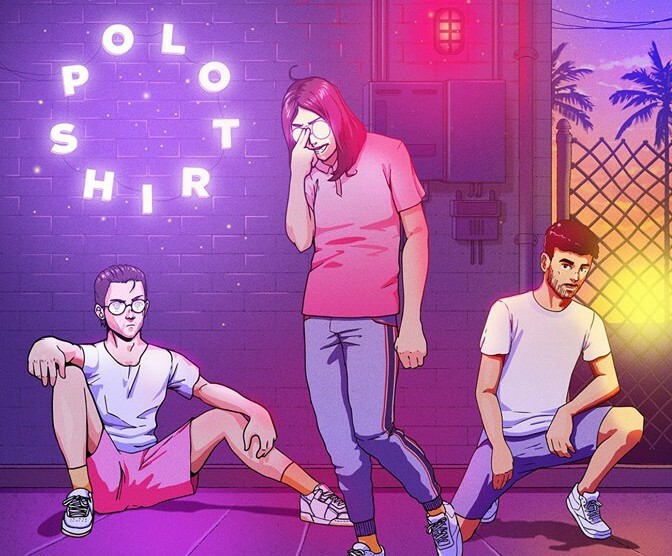 Playing their first string of shows together under the new joint project name, Poloshirt brought their self-titled, seven-track debut EP to life with help from all three of the featured guests – Price J, Nasty Mars and Jordan Dennis. The Polographia boys handled the keys, synths, guitars and drums, an amazing guest bassist held the groove together, and Winston’s signature velvety vocals rapped and sang his way through their catchy tracks. All seven of their debut songs are just as catchy as the last, sporting groovy bass lines, simple drums and easily-remembered hooks that involved every member of the audience. It was truly one of those gigs where it was impossible to stand still – even if you just bopped your head and shoulders. Their debut single ‘Pinned Upon’ was a standout, as the crowd sang every word and danced their way around each other to its slow-burning, spacey chords. Through the night, Winston’s vocals did just as much to hype everyone up as it did to throw the audience into a trance, forever locked into his mesmerising, creamy groove. The inclusion of a few Winston Surfshirt songs from their debut record, 2017’s Sponge Cake, was expected – thankfully it was brilliant. Favourites such as ‘Ali D’ had the Howler pumping, blasting the recognisable chorus across the sold-out room. It was refreshing hearing these tracks brought to life in a familiar, yet distinctly different way – I’ve seen Winston Surfshirt as a band on a few occasions, but this was something brand new. I like to picture Winston Surfshirt as what you listen to on a sunny afternoon, before transitioning into Poloshirt after dark. The harder drums and more abrasive reimagining of bass lines helped solidify this feeling – it was far more funky than the original tracks. Poloshirt demonstrated a simple yet creative live performance. Instead of playing ‘Beaterlude’ in its original 44-second length (after all, it’s an interlude), the boys turned it into a bouncing freestyle, allowing all members to show off their skill. It was great to watch – not only are they fantastic musicians, but clearly a bunch of really close mates having the time of their lives, just doing what they love. Further adding to this, they whipped out two genuinely incredible covers – a live version of Kaytranada’s electronic RnB track ‘Got It Good’, originally featuring Craig David on vocals, and a crowd-pleasing rendition of Cypress Hill’s hip-hop classic, ‘Insane in the Brain’. These covers were yet another reminder of Poloshirt’s exciting, fun-seeking nature, as well as their understanding of what makes a live performance both energising and memorable. Poloshirt is one of my favourite music projects to surface this year; when two interesting, talented but still relatively small acts join forces to create something new, it’s hard to know what to expect. I really believe this pairing under-promises and over-delivers, in the absolute best way possible. They have found the perfect match-up, vibe and sound for both groups to pursue together, and if their recent live performance is anything to go by, the future of Poloshirt is very bright and very groovy.